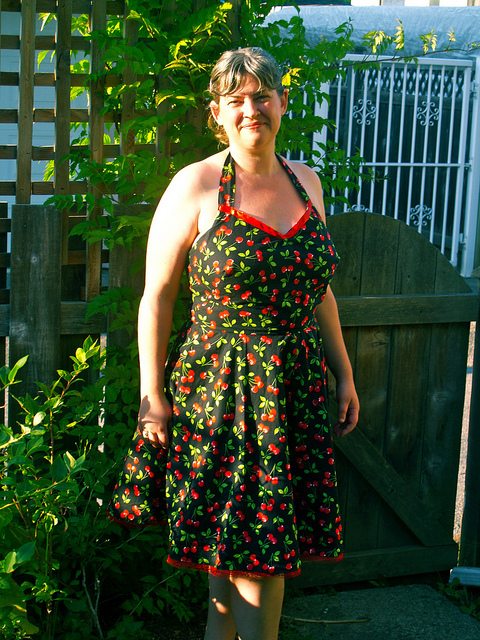 I cleaned out my dress closet last night in order to make room for this latest sewing project – the 1950s Cherry Halter which I have been plotting all summer long. It’s pretty much finished now except for a final mod I would like to do allowing it to be worn either as a halter *or* with straight straps. Besides this photo, this dress will not be making its true debut until a party we are hosting in September. Good thing it’s fully lined! While I was cleaning out said closet I found a number of clothing items that I really need to put back in circulation – in fact I got rid of very few things and just made sure the rest still fit – and it’s really worth acknowledging here that I probably don’t need anymore clothes. Not only do I have a fair number of skirts and dresses, they are almost all of high quality from the days when I was single and without mortgage and therefore could do thing like spend $150 on a skirt. On the other hand, I am just learning to sew clothes which means actually doing it, and on top of that I have a hundred ideas for new dresses, shirts and accessories that I just *have* to try even while admitting that I have plenty of nice things. Somewhere in there is a balance, and I’m pretty sure I’ll find it once grad school starts in September and my free time for hobbies is severely curtailed. In the meantime I have dreams of wool, denim and heavy cotton prints for autumn. Cotton scarves backed with wool. Needlepoint embellishments on hemlines. Culottes made of suiting material. And a new pair of tall black boots with a zip up the side to set it all off. How ridiculously “girl” of me. But fun to have a new obsession for awhile – projects to work on and show off even if I don’t have room for more of them in my closet. that seriously looks fantastic. well done! The halter style is great and the dress itself is classic and flattering! Love the cherry pattern. The closest semblance to sewing I’ve ever done is using a stapler to close up a split seam after I ran up some stairs and tore my skirt open. I gotta say though, the relative $ savings and the personalized fit you can accomplish makes me think it should be something I try and learn.